Preneoplastic lesions (aberrant crypt foci, hyperplastic/dysplastic polyps) are believed to be precursors of sporadic colorectal tumors (adenomas, adenocarcinomas). Aberrant crypt foci and hyperplastic/dysplastic polyps likely originate from abnormal growth of colonic crypts in response to aberrant queues in the microenvironment of colonic crypts. Thus, identifying factors which regulate homeostatic versus aberrant proliferation/apoptosis of colonocytes, especially stem/progenitor cells, may lead to effective preventative/treatment strategies. On the basis of this philosophy, the role of growth factors/peptide hormones potentially available in the circulation/microenvironment of colonic crypts is being examined extensively. Since the time gastrins were discovered as trophic (growth) factors for gastrointestinal cells, the effect of gastrins on the growth of normal/cancer cells has been investigated, leading to many discoveries. 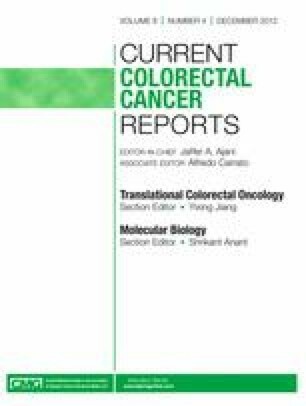 Seminal discoveries in the area of gastrins and colon cancer as it relates to molecular pathways associated with formation of colonic tumors are reviewed and the possible impact on diagnostic/preventative/treatment strategies is discussed. P. Singh is supported by NIH grant RO1-CA97959-(9). The authors thank Cheryl Simmons for her valuable secretarial help in preparing the manuscript and Claiborne Fant for helping with the graphic design of the figure. P. Singh: patent regarding vaccine against prograstrin pending (technology associated with the vaccine has been licensed by BioRéalités SAS, with licensing fees received by University of Texas Medical Branch); S. Sarkar: none; C. Kantara: none; C. Maxwell: none.